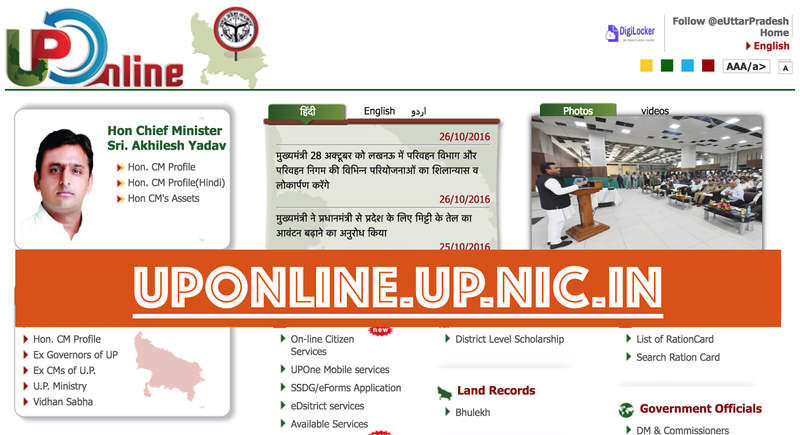 uponline.up.nic.in is the site for uttar pradesh citizens for online governemnt related services. All the services and links are listed at this site. e-Services for Citizens: Online services provided by the government to it citizens which are given below. G2C Services: Through this you can create account at uponline.up.nic.in and do all your online govt procedures through it. Government Orders: Links to all the orders given by the state government. Under social beneficiaries comes District Level Scholarship. All scholarship and social activities related links are given there. Public Grievances: Here public grievances are listed and listened to. Court Cases: All the public related court cases. Ration Card Details: This contains link to List of Ration Card of all UP inhabitants. You can also Search Ration Card for your particular state. Government Officials: Links to the list of top government officials in UP. Vahan: For vehicle related information and RTO forms. Tender: For online application to tenders and all tender related information. Commercial Taxes: Apply for trade and registration and commercial tax related things. Academics & Career: List of jobs, engineering colleges and examination results. Form download (in PDF): Links to online PDF forms available for various government related applications and procedures. The include Services Forms, Information Dept. Forms and VAT Forms. If you need information about anything else related to uponline.up.nic.in you can ask me in commnets below. All ration aadhar pan and voter id card related details are covered in this blog. I want to know the details of citizen service available at up online nic in website of Uttar Pradesh govt.